Yet Most Have Been Largely Unexplored Within Our Global Academic Community. Key Question: Are any of these ideas worthy of being explored further? Students have been known to ask a rather key question, i.e., “Can’t you make it easier to understand?” So, in light of the universal pursuit for simplicity, beauty and wholeness, our geometry classes just may have stumbled onto a path where we begin to see all the forces of nature/life come together in a somewhat simple, beautiful, yet entirely idiosyncratic model. It feels a bit like Alice-in-Wonderland — the entire known universe in 202 (but less than 205.1+) notations — all tied together with an inherent geometry. Could this ever so simple-complexity somehow be embedded deep within everything everywhere for all time? December 19, 2011: Defining our Parameters and BoundariesOver 120 high school students and about twenty 6th graders have taken a simple tetrahedron and divided each of the edges in half. 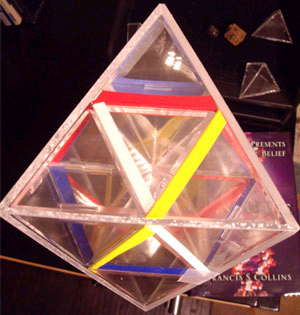 They connected the new vertices to discover four half-sized tetrahedrons in each of the corners and an octahedron in the middle. octahedron. They did the same with that octahedron and observed the six half-sized octahedrons in each of the corners and eight tetrahedrons, one in each face (opens in new tab/window). We continued this process mathematically about 116 times until we were in the range of the Planck length. octahedron. We eventually learned that this process is known as base-2 exponential notation.When we discovered-then-compared our work to than of Kees Boeke (Cosmic View, Holland, 1957), we thought base-2 was much more informative, granular, and natural (as in biological reproduction and chemical bonding) than Boeke’s base-10. Plus, our work began with an inherent geometry, not just a process of adding and subtracting zeros. We had taken those same tetrahedrons with their embedded octahedrons and multiplied them by 2. Within about 90 steps (doublings), we thought we were in the range of the recently-reported findings from Hubble Space Telescope and the Sloan Digital Sky Survey (SDSS III), Baryon Oscillation Spectroscopic Survey (BOSS) measurements (opens in new tab/window) to bring us out to the edges of the observable or known universe. It appeared to us that this perfect conceptual progression of embedded tetrahedrons and octahedrons could readily go from the smallest possible measurement to the largest in less than 209 notations. We decided at the very least it was an excellent way to organize the data in the entire universe. Key Question: Are these the largest-yet-the-simplest parameters with which to engage the universe? We had also develop a big board (1′ by 5 ‘) upon which to display this progression so we could begin inserting and updating examples from the real world within each notation (domain, doubling, or step). To simplify the look and feel of those listings, we also made a much smaller table (8.5″ x 11″) in September 2012. Key Question: What are the necessary relations between adjacent notations? We had also consulted with Jean-Pierre Luminet, a French astrophysicist and research director for the CNRS (Centre National de la Recherche Scientifique) of the observatory of Paris-Meudon. He calculated 205.1+ notations: https://doublings.wordpress.com/2013/07/09/1/#Footnotes See footnote 5 on this page within doublings.wordpress.com. December 2012: What is the Planck Length? Is it a legitimate concept? We consulted Prof. Dr. Frank Wilczek (MIT) regarding his many articles in “Physics Today” about the Planck Length. He assured us that it was a good concept and that the Planck Length could be multiplied by 2. We titled our next entry, “Everything Starts Most Simply. Therefore, Might It Follow That The Planck Length Becomes The Next Big Thing? The current state of affairs in the physics of CERN Labs is anything but simple. We figure if we built things up simply, we might gain a few new insights on the nature of things. Through Frenkel’s work we have begun to discover the Langlands Program and its progenitors (i.e. Frobenius) and the current work in areas like sheaves, the categorifications of numbers, and the correlation functions. We have begun to learn about the work of other remarkable mathematicians like Grothendieck, Drinfield, Witten, Kapustin, and so many more. The most important first-impression was that we could begin to discern the transformations from one notation to the next and possibly even discern the very nature of a vertex. Over a Quintillion vertices within just the 60th notationThroughout these past 2+ years, we have discerned other simple-yet-interesting mathematical facts, First, we decided that we should not refer to the Planck Length as a point because it is a rather exact length, so we are giving each vertex a special status and believe we might learn more by understanding Alfred North Whitehead’s concept of pointfree geometries introduced within his book, “Process and Reality.”Within just the 10th doubling there are 1024 vertices. The simple aggregation of all notations up to 10 would be 2046 vertices. Within just the 20th doubling (notation) alone there are over 1 million vertices. In just 30th notation alone, another one billion-plus vertices are created. Within the 40th notation another trillion-plus vertices. With just the 50th notation, you’ll find over a quadrillion vertices. By the 60th notation, a quintillion more vertices are created. Imagine all the possible hidden complexity. The expansion of vertices within each doubling has been a challenge for our imaginations and conceptual limitations. Yet, it could be an even greater challenge and far more complex if we were to follow Freeman Dyson’s suggestion. Freeman Dyson, in a personal correspondence to me for which he gave me permission to share, suggested the following: “Since space has three dimensions, the number of points goes up by a factor eight, not two, when you double the scale.” Of course, we felt we had more than enough vertices with which to contend, so we just multiplied by 2, using the simple analogue from biology or chemistry. Of course, his suggestion could readily open even more doors for new explorations. Is the inherent structure of the first 60 notations shared by everything in the universe? With our simple logic, it seems that with the diversity of particles and the uniqueness of identity, that the structure could continue to expand right up to the 202.34 to 205.1+ notations. However, below that emergence of measurable particles, and their aggregate structures, a simple logic would tell us that there is a cutoff point as you go toward the Planck Length where a deep-seated Form (perhaps notations 3-to-10) and Structure (perhaps notations 11-20) might somehow be shared by every thing in the known universe. With vertices rapidly increasing with every doubling, options begin to manifest for types of Substances (possibly notations 21-to-30), then types of Qualities (perhaps notations 31-to-40), then types of Relations (possibly 41 to 50), and finally types of Systems (possibly 51-to-60). What does that mean? How are we to interpret it? It is on our list to continue to ponder. We’ve thought about this very, very small reality from the first notation to the 60th. Perhaps it is what Frank Wilczek (MIT) calls the Grid and Roger Penrose (Oxford) calls Conformal Cyclic Cosmology. We just call it the Small-Scale Universe. Actually in deference to one of my early mentors, we call it the “really-real” Small-Scale Universe. And, because we started with simple geometries, our imaginative notions of this part of our universe appear to be historically explored yet relatively unexplored as a current scientific framework. First, we turned to our six sections: Forms (Eidos), Structures (Ousia), Substances, Qualities, Relations, and Systems (The Mind). Also, picking up a suggestion by Philip Davis (NIST, Brown), that the sphere is more fundamental than the tetrahedron, we start with a one-dimensional length, the Planck Length. When it doubles, it becomes a two-dimensional sphere. When it doubles again (4), it becomes a three-dimensional sphere with a tetrahedron within it. 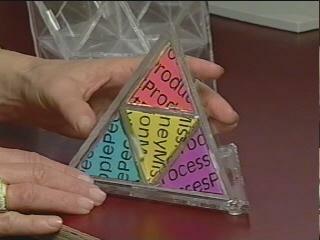 When it doubles again (8), we see the octahedron within the tetrahedron. When it doubles again (16), we begin to see the four hexagonal plates within the octahedron. We are projecting all these forms-structures, substances-qualities, relations-and-systems are complexifications of the first two vertices within the first doubling. We further project that there is a transitional area between each of the three scales, Small-Scale Universe, Human-Scale Universe, and Large-Scale Universe and each would include somewhere between 67-to-69 notations. We discovered the writings of Natalie Wolchover within Quanta Magazine, quantum geometries, and on the work of Andrew Hodges (Oxford), Jacob Bourjaily (Harvard) and Jeremy England (MIT). We believe these young academics are opening important doors so our simple work that began in and around December 2011 has a larger, current scientific context, not just simple mathematics. Within the excitement and continuing evolution of the Langlands programs, we perceive it all in light of defining a science of transformations between notations. We are now pursuing all the primary references for people working within quantum geometries. The simplest, smallest, largest experiment and other thought experiments based on the simplest mathematics: The first attempt to look at this data in a radically new way was best represented within a science fair project by one of our students. Several unusual, new views of the universe took shape. January 2012: Is there a concrescence in the middle? Is the ratio, 1:2, somehow special? Approximately between 101 and 103, clustered in the middle by the width of a hair, are paper upon which we document our history and the human egg. Perfectly human representations in the middle of this scale became a source for some reflections. Between Notation 66-to-67 and from 132-to-134: The significance of the first third, particularly the transformation from the small scale to the human scale, was obvious — particles and atoms. The last third, the human scale to the large scale, we played with ideas, then made an hypothesis. In a most speculative gesture, turning to the Einstein-Rosen bridges and tunnels, we posited that range as a place to begin looking for wormholes. We are now studying the fourths, fifths, sixths and sevenths… wondering in what ways are there parallels to music. How do things combine, mix, and move together to create a specific thing or a new thing? We began studying the notational ranges defined by simple mathematics and music to see what we could see. To date, our very cursory, initial observations have not opened up more wild-and-crazy speculations! However, the obvious parallel to music has us thinking about the nature of chord, half notes and ratios (July 2014). 1971-2012: Synectics, Polymorphs, Colloquiums, and moreWe are products of our experience. In 1971, when I (Bruce Camber) was just 24 years old, though active in the radical-liberal political community, my longstanding intellectual curiosity was the nature of creativity, the processes for problem-solving, the nature of a paradigm, and the stuff of scientific revolutions. At a think tank in Cambridge, I focused on interiority, analogies, empathy, and processes to open pathways to a deeper sense of knowing and insight. Within a Harvard study group, the Philomorphs, I studied basic geometric structures with Arthur Loeb. At Boston University, I was deeply involved with the weekly sessions of the Boston Studies in the Philosophy of Science with Robert S. Cohen, chairman of the Physics Department. It was within this mix, that the form-and-function of a momentary perfected state in space and time was engaged (continuity-order, symmetry-relations, harmony-dynamics).For many years, that formulation drove my studies to the point of ignoring all else. Now, years later, that work continues. Let’s develop a community of people and schools who are working on this simple structure. Please let us know if you are interested. Please share your helpful comments.